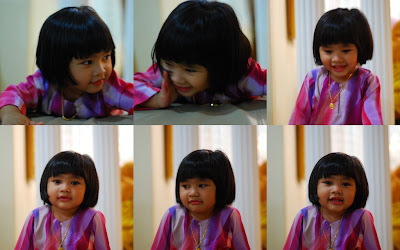 During the recent Hari Raya, relatives came to my mum's house. Nothing unusual right? Suddenly I was 'introduced' to my 'cucu' (by rank). I went "OMG..nooooo...that cant be true". To cut the story short, my 'cucu' and I hit it off quite well. She followed me everywhere and made numerous attempts to have a conversation with me. She's a big fan of Barney, and her favourite phrase is "Oh no.....". The result of 'merempit', or street racing....this 'samseng jalanan' and his friend were flung down a slope when his motorcycle skidded. Both 'suffered' serious injuries and required urgent medical assistance. I cant sleep tonight...don't know why. Maybe its because I had slept in front of the TV while watching CSI. Maybe also coz they haven't bank in my pay even though its pay day. How to honour the numerous standing instructions for all my bills? Thus a round of juggling act, defeating the purpose of subscribing to the convenience of standing instructions in the first place...to no fault of mine. If this goes on, maybe I need to....well, we'll see. The topic this time is on environment. Everyone is talking about it, in the papers, on talk shows, on radios (Ean from Hits morning crew diving with sand tiger sharks in Aquaria) etc etc. 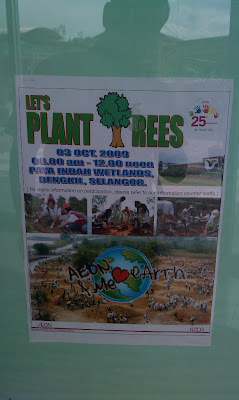 I came across this poster last week when I was over at this particular shopping mall across the road from my office.